We are experts at repairing and servicing all brands and models of disposals. If your disposal is jammed, runs noisily, it’s leaking or you have any other problems, simply call our toll free number and we will take care of rest, bringing your disposal in perfect working order. The information below is provided strictly to help you to learn more about your disposal unit. It will also help you use your disposal in the most effective and efficient ways, which will also reduce your utility bills and extend the life of your disposal systems. The most frequent disposer service problem is jamming. 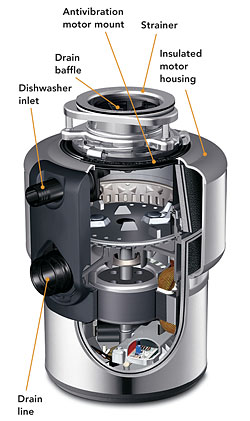 Un jamming disposer can be accomplished by reversing the motor, a feature on many disposers. Some reverse automatically if the motor stalls for any jamming can’t be cured by reversing the motor, you must repair the problem in another way. The first rule in servicing any disposer: Be sure power is turned off. Be carefully if its necessary to insert your hand into the mouth or hopper of a disposer, disconnect it from the power supply by unplugging from an outlet or pulling the circuit fuse and disconnecting the wiring junction box if’ the disposer is connected permanently. In extreme cases you may have to disassemble the disposer Ito remove the foreign object. Only two or three other reasons would require disassembly. The first would be for replacement of the shredding disk (flywheel) and shredding ring. This normally is needed only after years of hard service. Second, it may be necessary to replace the scab Always do this when replacing the shredding ring. High-quality neoprene seals in modern disposers last for years and normally good for the life of the appliance. Finally, in case of motor failure, I the disposer would have to be removed from the sink and the housing assembly would have to be removed. Accompanying photograph show you how. But be forewarned that on many older disposers housings were sealed and are not serviceable. For the most part disposers were covered with long-term warranties. Other components are easily serviceable from outside the cubit these include the motor starting relay, overload protector, and reversing switch. Often a capacitor is used with a split-phase provide more starting torque, a highly important requirement for An appliance in this type of service quickly pinpoints problem in these areas. Check for disposer grounding after reassembling. There is easy way to make an unjamming tool for those hard-to-budge jams. Using a piece of ’14″ x 1″ steel stock, measure the distance from the the flywheel nut to the edge of the ear found on most such units. Grind or cut a notch in the end of the stock to fit the ear into the hole slightly larger than the flywheel nut as indicated. Finally, insert the L-shaped unplug the disposer and insert it so that the nut is within the hole of the mid the ear is in the notch. Now, with a crescent or other suitable wrench which can easily apply be to the disk to loosen all but the most stubborn jams. Don’t apply too much force or you’ll damage the mechanism. We service the following counties and cities. © 2015. All right are reserved. We Service All Major Refrigerator, Dryer, Washer, Microwave, Oven and Range Brands, Garbage Disposal, Freezer, Compactor, Range Hood, Convection Oven and Accessories.